Here is an updated Rockport fishing report for late October. Since the weather has finally changed around here, as well as the fishing, we thought we would update our report for those out and about this weekend. So here is your report for those fly fishing Rockport or the surrounding areas. The sun finally made an appearance for us late this week. Friday morning greeted us with clear skies, calm winds and a whole new outlook on things around here. We had not seen the sun in over two weeks. So it was much needed around here, for both the sake of fishing, and our sanity. With the sun coming out, the fly fishing has been good. In fact, it has been really really good. We’ve had quite a few tailing fish, small schools and tons of cruisers to cast at. Very favorable tides have been moving a lot of water the past few days. On top of that, water temps on the Texas flats are hovering around 70 degrees in the mornings. That has our fish plenty happy and moving around well. Friday was all about tailing fish. 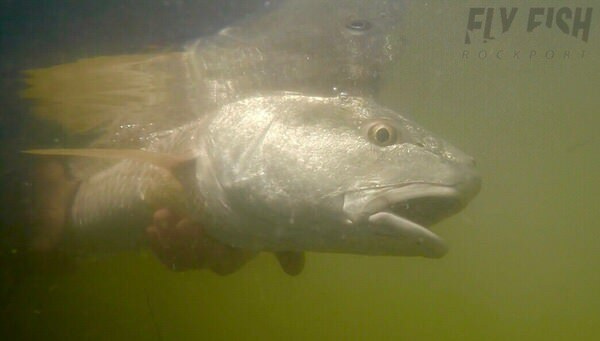 Redfish were consistently found rooting around in the widgeon grass all day. If you were shallow enough, you would see tails. Most were singles, digging for food here and there. But the occasional pair was also seen. Or, small schools of 3-5 cruising atop the grass were fairly common as well. All were plenty happy to eat. A lightly weighted shrimp or reducer was our choice, as it was easy to fish above the grass. This morning we were again greeted with clear skies and fairly calm winds. We were fishing in San Antonio Bay, just shy of Seadrift. Before we had even gotten rods rigged up, there were multiple crashes along the shallower banks. Just a few minutes later, we had our first redfish in the boat. There was plenty of activity early, and it continue to get better and better throughout the day. There were lots of fish landed on a variety of different flies. Honestly, it didn’t seem to matter much, so long as you got it where they could see it. Most of the fish encountered today were really aggressive, once they saw the fly. We had everything from singles to schools of 5 or so fish today. Most were cruising banks in search of food. As quickly as you unhooked one, you would be struggling to get yourself ready in time for the next fish swimming towards the boat. Or, when we did have a second rod at the ready, there were a couple of double hookups today as well. It’s looking like much more of the same, at least as far as weather, for the coming days. Sunny skies, fairly low winds and hopefully lots of happy fish. Now that the water is cooler, a little bit lower (but not much) and the sun is shining, the fishing is finally where it should be for this time of year. Hopefully the weather continues to cooperate for a few weeks for us now. After a rather tough earlier October, it feels like we deserve it around here. We are on the water every day, for the foreseeable future. So we will keep the updates coming. Also, stay tuned for a couple new video edits in the works. One from the trip to MSTPA in Alaska, and a fresh redfish edit as well. Hopefully we can get those wrapped up here in the next week’s time. You can always email any time if you would like any up to the minute Southwest Texas fly fishing or Rockport fishing type news. We continue to post on Instagram, Facebook, Twitter and Snapchat. Or perhaps SUBSCRIBE to our YouTube Channel as well. We continually are trying to add more videos and stuff there. We try to keep stuff fresh for those of you that are wishing you were on the flats with us. So be sure to follow us on all our social media stuff. And don’t forget to sign up for our monthly newsletter below.